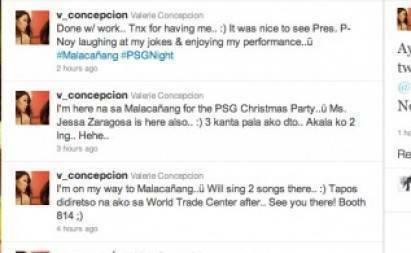 Interaksyon.com posted this screenshot of actress Valerie Concepcion’s initial tweet about the Malacañang party. The tweet has since been deleted. (SPOT.ph) Actress Valerie Concepcion may have unwittingly incited online furor when she tweeted that she attended a party in Malacañang on Sunday, December 18, in the wake of tropical storm Sendong’s devastation in Mindanao. In her tweet, Concepcion had revealed that she had seen President Benigno "Noynoy" Aquino III at the said event, the Christmas party of the Presidential Security Group (PSG). Part of her tweet said, "It was nice to see Pres. P-Noy laughing at my jokes & enjoying my performance." "I just want to clarify that I was invited to perform at Malacañang’s Christmas Party for their employees with their husbands/wives and kids. Yes, the president attended the gathering. I do not see anything wrong with that since its his obligation and responsibility being the head of Malacañang to be present and show his support for his hardworking employees and their respective families. But I believe that it doesn’t mean that the president is not thinking of ways to help our kababayan(s) in Mindanao. It doesn’t mean that the president is disregarding the plight of our fellow Filipinos. Let’s not be too quick to judge. (cont...)"
"(cont...) But if I, in any way, offended you guys and sounded insensitive, I am very sorry. It wasn’t my intention to do either. I can’t imagine how difficult life is for the people affected in Mindanao and how difficult it is to be the president of the Philippines at this moment. Once again, I am very sorry for all those people I have offended. May God bless us all." Concepcion "explanatory tweet" was also posted on Sunday, December 18.